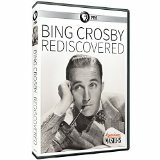 Bing Crosby Rediscovered (2014), a PBS documentary that originally aired as part of its American Masters series, hits all the right notes. Though it runs just 90 minutes, too short, really, to completely cover every facet of this multimedia star's professional and personal life, it nonetheless intelligently and perceptively hits all the salient points. And though made with the cooperation of Crosby's estate and family, it doesn't shy away from Bing's darker side, the frank, emotionally distant yet brutal disciplinarian whose first family led profoundly unhappy, self-destructive lives (alcoholism, multiple suicides), though as this documentary clarifies, a great deal of that wasn't really Crosby's doing, at least not directly. More importantly, the show serves to remind viewers of Crosby's incredible, never-to-be-duplicated musical legacy. When Bing was alive, he was pretty much taken for granted, partly because his performing style was so casual, intimate, and unaffected. Crosby was an incredibly prolific recording artist, but beyond that he was a constant presence on radio, in the movies and live personal appearances and, later, a fixture on television, especially in his nearly annual Christmas specials. And yet there was a time when audiences went wild for him the same way they would later riot over Sinatra, Elvis, and the Beatles. Amusingly, the documentary points to a newspaper clipping in which one zealous fan attacked a Sinatra admirer with an ice pick. Crosby's stats speak for themselves. He remains the Number One recording artist of all-time, bigger than The Beatles, bigger than Elvis Presley. The documentary calls him the first multimedia star, a debatable claim as Al Jolson conquered the same media a few years before Bing did, albeit with less long-lasting success. Bing Crosby Rediscovered's interview subjects rattle off more astounding achievements, one after another: that his radio shows had 50 million weekly listeners (today's hit TV programs are lucky to pull in 6 million). That between 1942 and 1962 Crosby had a Top 40 hit in every year but one. That he recorded a staggering 600 singles, of which more than half charted, including forty-one No. 1 hits. Add to that he was successful in myriad musical genres, from Hawaiian music to gospel to cowboy songs, as well as third-most popular star ever of Hollywood movies, primarily comedies and musicals, but also, occasionally, dramas. Written, produced, and directed by Robert Trachtenberg, Bing Crosby Rediscovered moves like lightning, mixing incredibly rare archive film footage and audio (including interviews with Rosemary Clooney and Al Rinker), including Bing's own voice on dictabelt recordings, writing scathing letters to family members and business associates, with astute and observant interviews. Among the new interviewees: performer and musicologist Michael Feinstein, Tony Bennett, Crosby biographer and jazz critic Gary Giddins, and members of the Crosby family, including second wife Kathryn (Grant), she having recovered from a near-fatal car accident several years ago that killed her second spouse. The show is perhaps best exploring the evolution of Crosby's performing style, one that, in its early days especially, combined innovative jazz phrasing (Feinstein, quoting Artie Shaw, said that Crosby was "the first hip white person in the United States") with a more relaxed, conversational style that set him apart from belters like Jolson. The original crooner, Crosby influenced scores of the great singers that followed in his wake, including Sinatra, Bennett, Clooney, Perry Como, and Dean Martin. Trachtenberg makes the interesting choice of having all of his interview subjects seated at tables in fairly barren soundstages, making their comments less cozy and anecdotal, but also more direct and immediate. Almost everything they say helps the viewer understand some facet, musically or personally, of this enigmatic figure. Other surprises include a long-buried, super-secret screen test of Crosby, unrecognizable under heavy make-up, as Will Rogers, for a proposed biopic eventually made with Rogers's son instead. (Crosby, unsurprisingly, is very good.) The musical excerpts of Crosby, from his memorable appearance in The King of Jazz (1930) to his cultish "Little Drummer Boy" duet with David Bowie on Crosby's last Christmas special (which aired after Crosby's death), are terrific. Many discuss how Crosby generously made his singing partners look even better, and his duets with Sinatra, Clooney, Louis Armstrong, Ella Fitzgerald, et. al. are tops. And the show takes time to point out Crosby's significant role in one of the biggest technical innovations of the century, the dissemination of magnetic audiotape. The movie pulls no punches on Crosby's failings as a father and husband, pointing to heavy drinking and carousing early in his career that contributed to first wife Dixie Lee's own drinking problem, and alternating between inattentiveness and ruthless scolding toward his four older boys, several of which may have suffered from then-undiagnosable fetal alcohol poisoning. After Lee's death and Bing's second marriage to actress Kathryn Grant, Crosby appears to have earnestly tried to be a better parent with his second set of children, who in new interviews seem better adjusted. The show acknowledges first son Gary Crosby's image-altering tell-all book, Going My Own Way, even including archival video interview footage of Gary, but it also quotes Bing's later children, who state Gary later admitted to them that a lot of Bing's physical abuse was exaggerated or fabricated to sell more books. Nonetheless, dictabelt recordings of Bing writing letters to Gary reveal, by today's standards, some awesomely cruel parenting. 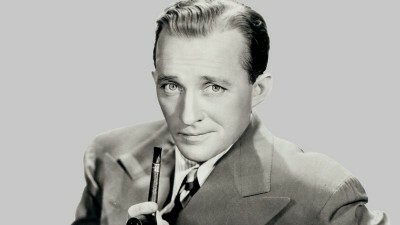 Bing Crosby Rediscovered is presented in 16:9 enhanced (1.78:1) widescreen, with most of the film and all of the archival TV clips 4:3. The show looks good throughout, and the audio, mostly mono recordings of Crosby but otherwise Dolby Digital 5.1 surround also sounding fine and supported by English SDH. The disc is Region 1 encoded. Supplements include around 13 minutes of unused bonus footage that's very worthwhile, along with an interview with director Trachtenberg. A must-see for anyone interested in 20th century popular culture, Bing Crosby Rediscovered reaffirms his incredible musical legacy and is a DVD Talk Collector Series title.